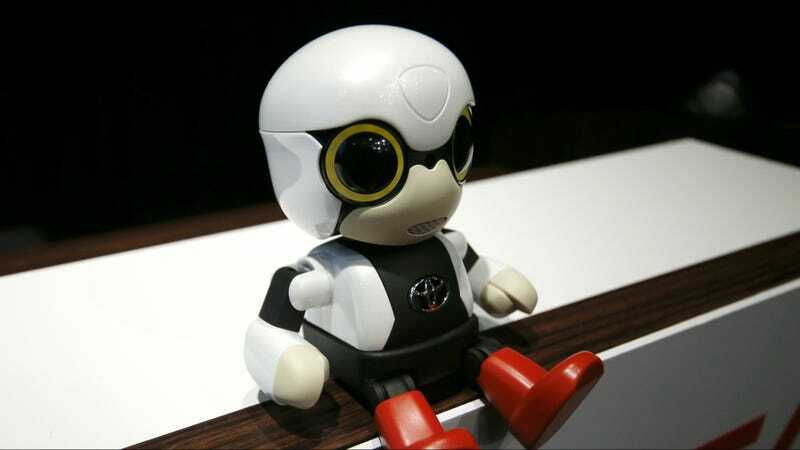 Japan’s birth rate has been on decline for some time now, so engineers at Toyota have come up with an ingenious solution to help people apparently feel the companionship of kids: an annoying robot. The Kirobo Mini also speaks in a high pitched voice, just like a real baby that will never let you get any sleep and is slowly ruining your marriage. And, just like a real baby, it will drain your wallet. This freak robot costs $392. Toyota’s non-automotive venture aims to tap a demographic trend that has put Japan at the forefront of aging among the world’s industrial nations, resulting in a population contraction unprecedented for a country not at war, or racked by famine or disease. The Kirobo also has a cupholder shaped “cradle” so that you can bring your demon baby robot around town and so that it can constantly distract you while driving. The palm-sized robot, with big eyes and red shoes, is small enough to be carried around. When placed in cars, it encourages safe driving by saying phrases such as “Oops!” when the driver suddenly brakes, and “Don’t leave me behind”, when left in the vehicle.